This is no marketing gimmick. For every 12oz bag of Open Seas coffee you drink we are actually giving an average of 210 L of clean drinking water to real villagers in one of our source countries. That is over 35 days worth of potable water per bag. 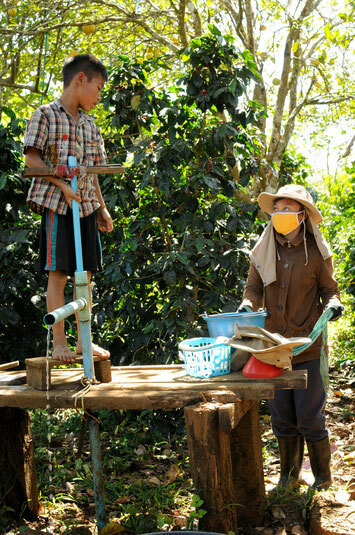 Through our 10-4Farmers Initiative we are investing 10% of our gross profits into sustainable water filtration systems for coffee farming communities and surrounding areas. Doesn’t it rub you the wrong way when you hear a marketing scheme that is only possible if the stars align perfectly? Me too. Who likes a bragger anyway, especially one who can’t deliver. That is why we use averages and conservative numbers in the statement above, so that you can expect to see the impact we are claiming. I agree with the adage, “under promise and over deliver.” But don’t just take our word for it, the details are below, see for yourself. So for question 1, we are partnering with social businesses, like TerraClear, that operate in our source countries to provide ceramic water purifiers (CWP’s) to villagers. These systems are usable for almost any rural water source, need minimal maintenance, and only require around $8 U.S. every 2 years to keep them working effectively. For more information on CWP’s check out Potters Without Boarders and Potters for Peace. I worked for over 4 years manufacturing these filters in S.E. Asia and can vouch for them personally, its what my daughter drank for the first 2 years of her life. The subsequent question is, “how is the 210L calculated?” Each filter flows at a rate of 1.7-3.5L/hr., meaning that there will be inherent variation in every unit. For our calculations we used the 2.6 average flow rate for the filters because this is the most realistic impact across the 10-4Farmers Initiative as a whole. But if the stars perfectly aligned the impact could be up to 283L per 12oz bag. On to question 2, “210L is 35 days worth of water according to who?” There are so many variables that contribute to a recommended number of L/day; climate, humidity, altitude, gender, age, weight, season, and energy output to name a few. In addition to all that it depends on whose research you want to pull from. So before this turns into a research project, I’ll summarize for you with source links for further investigation. Recommended water consumption from USDA is 3.7L/day for a male and 2.7L/day for a female (2nd to last page). The Tropical Agriculture Association recommends 4.1-6L/day in a tropical zone (page 8). WHO’s (World Health Organization) recommendation is 4.5L/day for those who are physically active and/or have exposure to increased temperature (Table 6). Since coffee grows in hotter climates and coffee farming is a very labor-intensive occupation, we decided to use 6L/day for our calculation even though it is on the higher end of the spectrum. Transparency is a vital part of holding businesses accountable and we are no exception. We want to be a part of a new business culture. One where businesses are impacting the world for the better and the question “How does this benefit the world around us?” carries as much weight as the question “How does this impact on our bottom line?” This mentality has shaped who we are and how we position our business. It affects how we engage with prospective farmers, our suppliers, our wholesale partners, and even how we give back. But don’t buy our product just because of the impact; let the coffee quality speaks for itself.